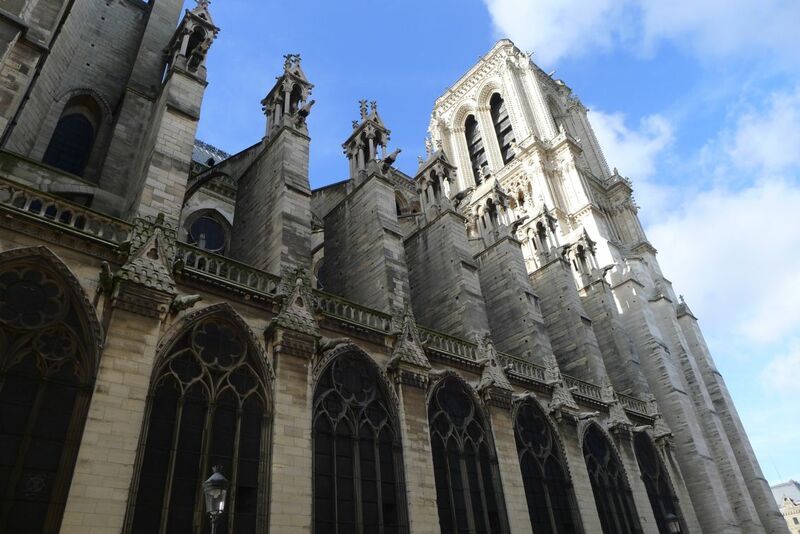 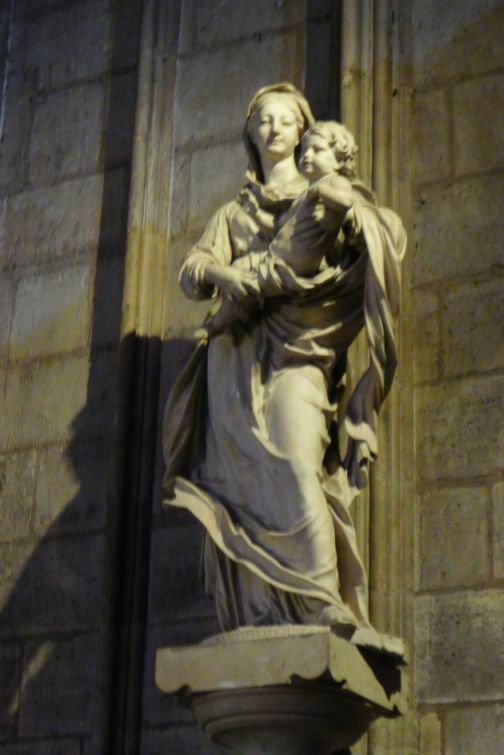 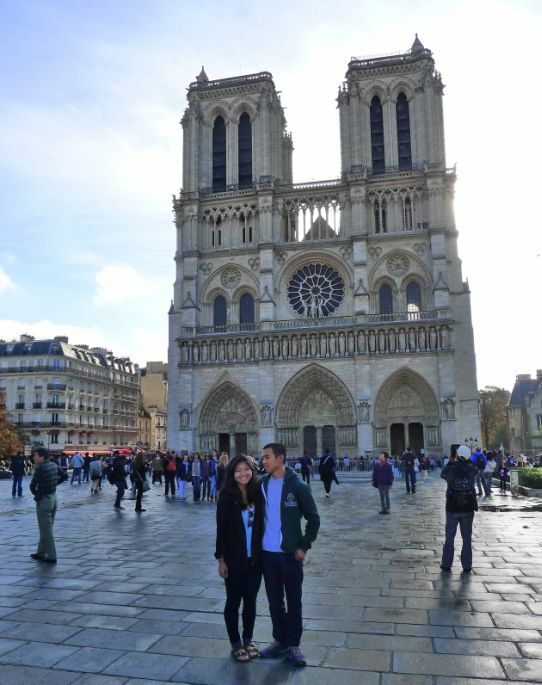 This is Kristy first visit in Paris and we are taking her to see the well-known Notre Dame de Paris considered to be one of the finest examples of French Gothic architecture. 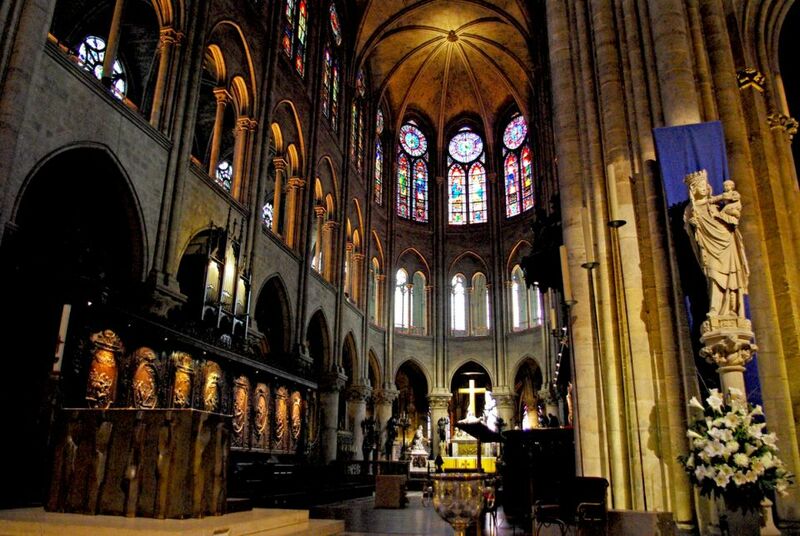 Notre Dame de Paris, located at the heart of Paris, remains the biggest draw for visitors from around the world. 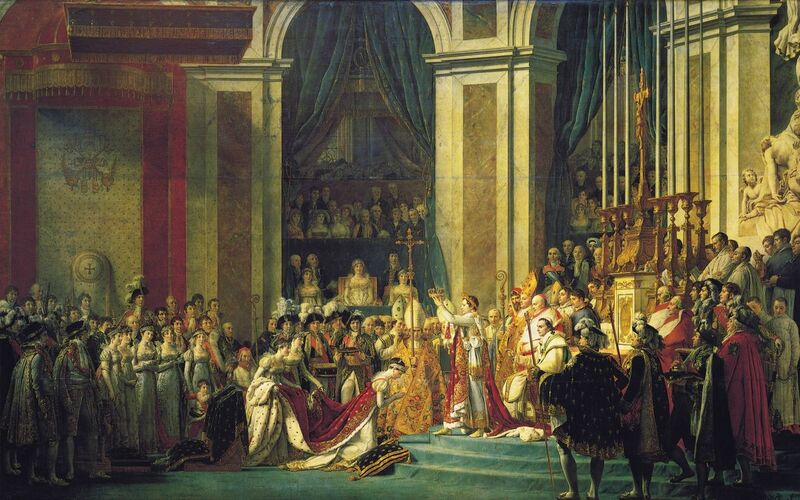 Napoleon was crowned here and was immortalized in Jacques Louis David's master piece: The coronation of Napoleon (located at le Louvre). 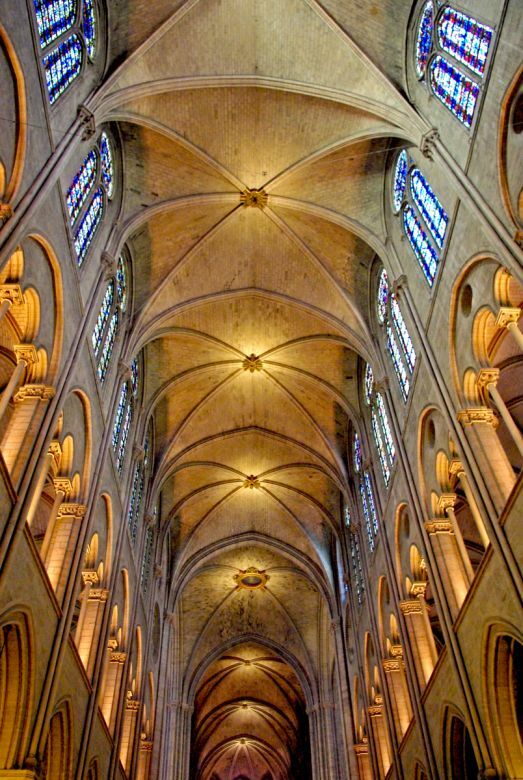 Kings and queens exchanged marriage vows before its altar and the cathedral was the setting for Victor Hugo’s historical novel "Notre-Dame de Paris" (1831) and is probably best known for its relation to the story of the Hunchback of Notre Dame. 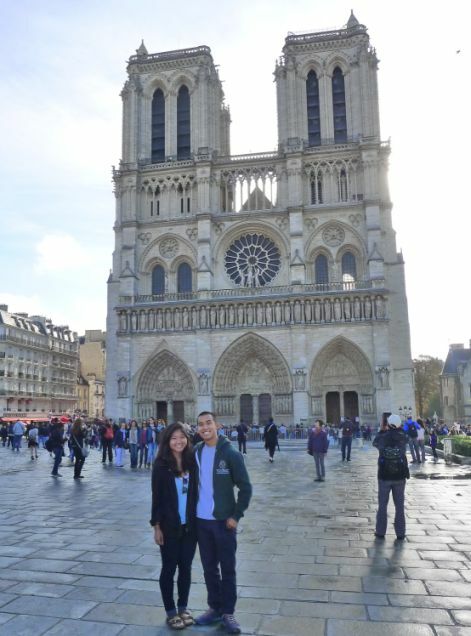 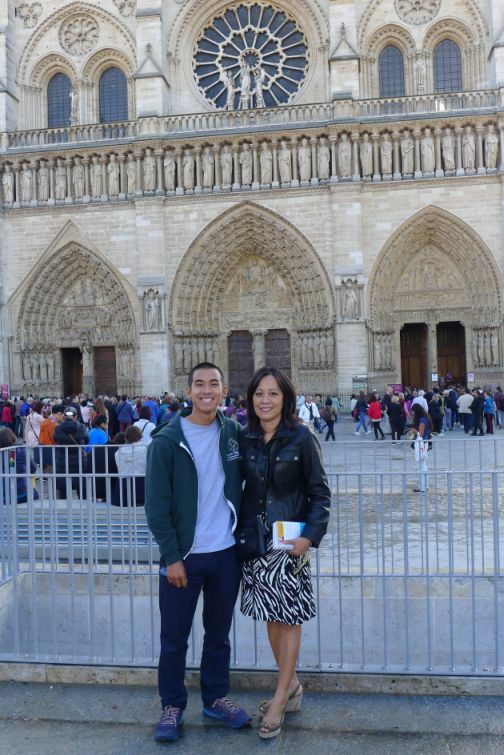 Kevin and Kristie in front of Notre Dame. 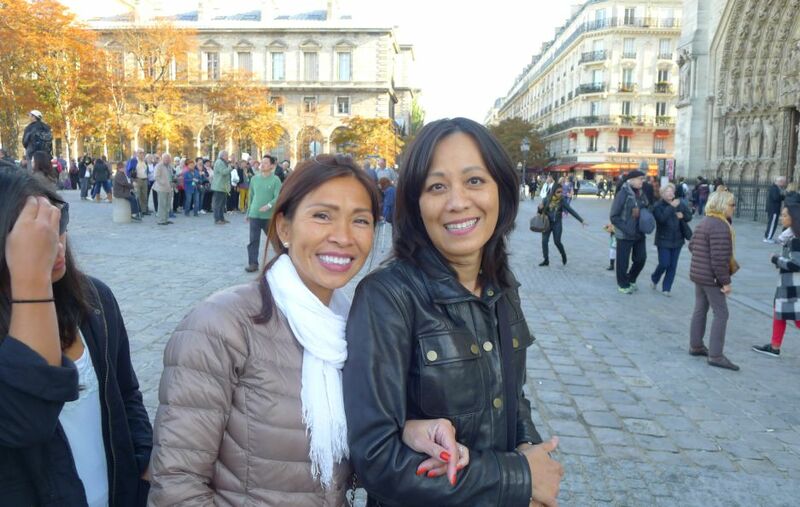 We also meet up with Cang (Hoa's sister) and Thuan (Hoa's brother) for a stroll in Paris. 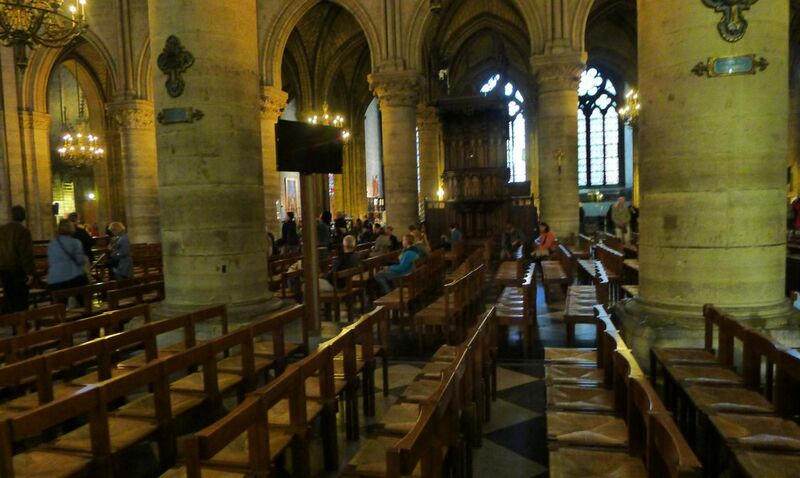 Getting in the church. 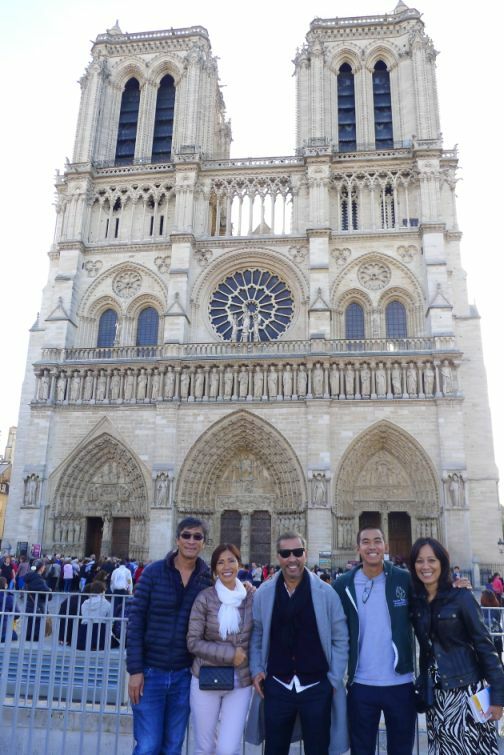 We were surprised to find out that Cang has never been inside the cathedral even though she lives in Paris for 40 years. 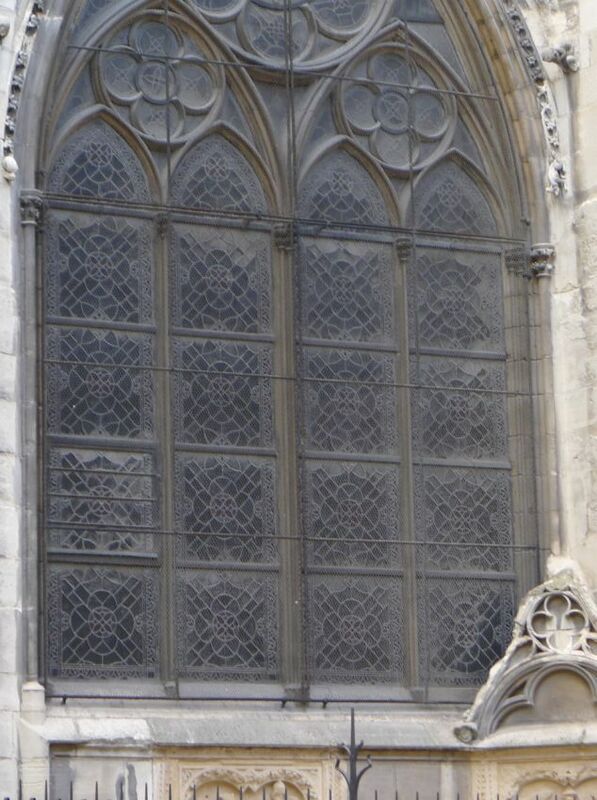 This is the West front facade featuring 3 portals but you can only see 2 of them in this picture. 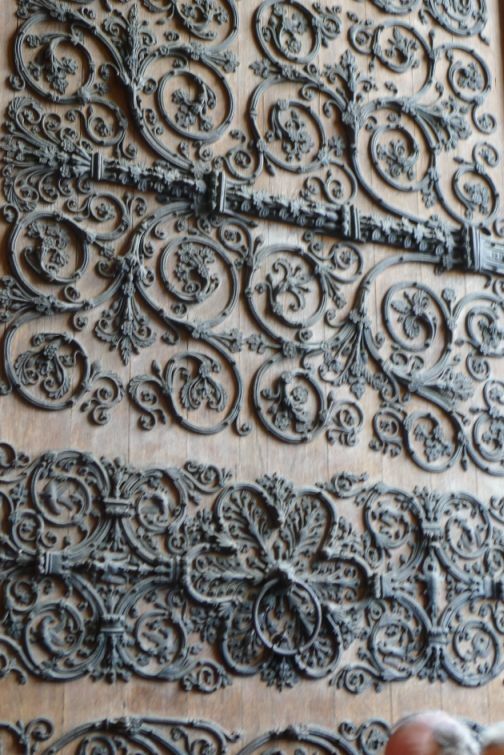 On the left is the portal of the last judgment (more close up below). 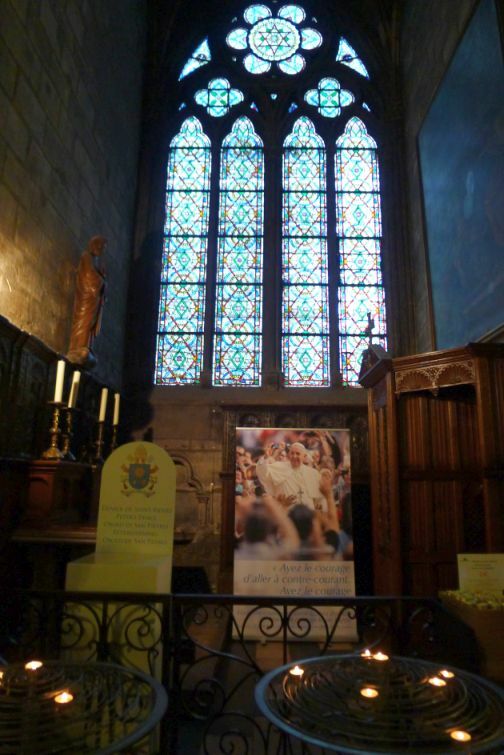 On the right is the Saint Stephen portal. 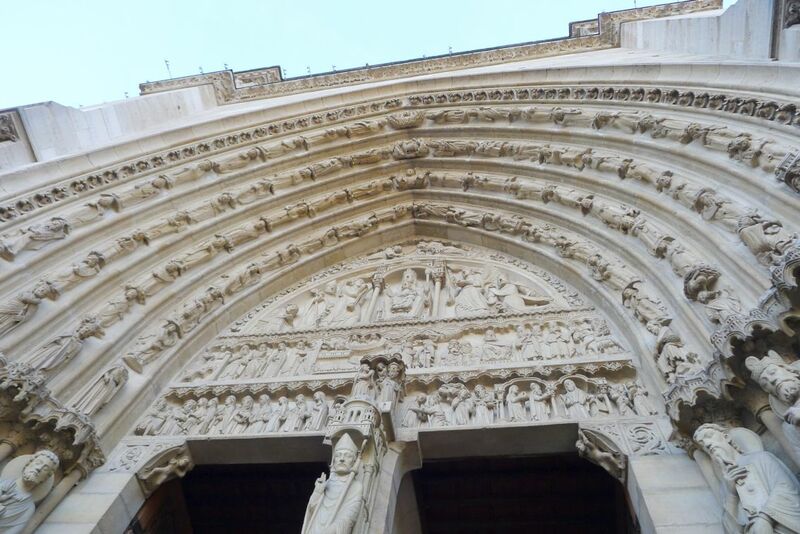 The King of France, Saint Louis, had this portal built on the south side of the cathedral as an homage to Saint Stephen, who was stoned for preaching the Gospel. 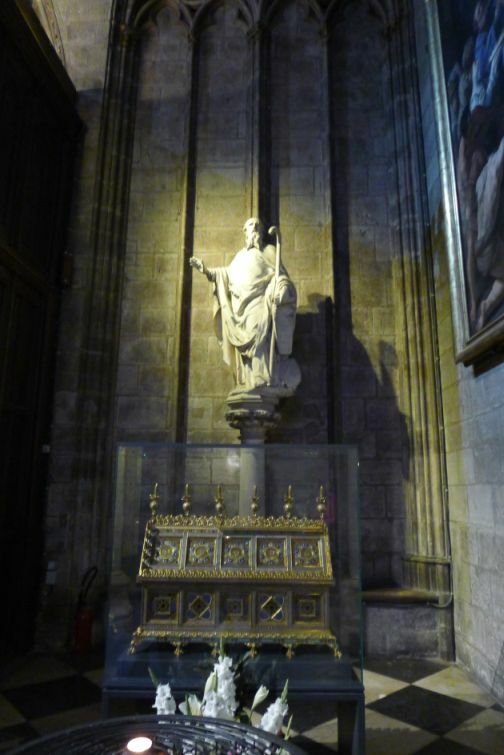 It shows episodes from his life, including his martyrdom and his burial. 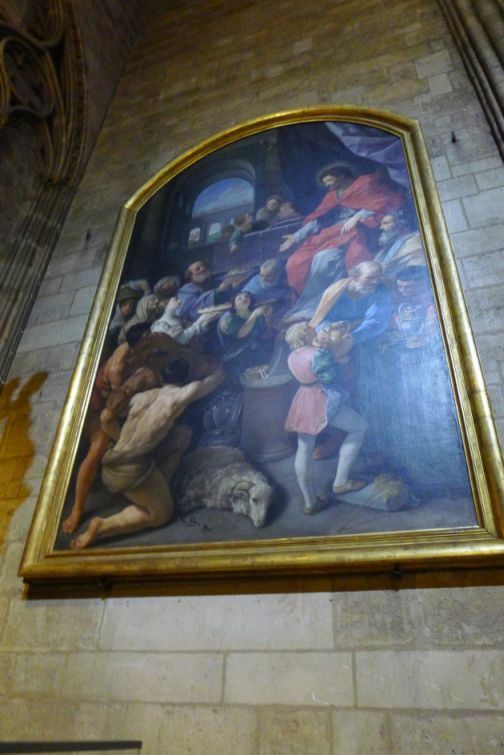 Jesus is present at the top of the scene, blessing Saint Stephen and welcoming him to Heaven. 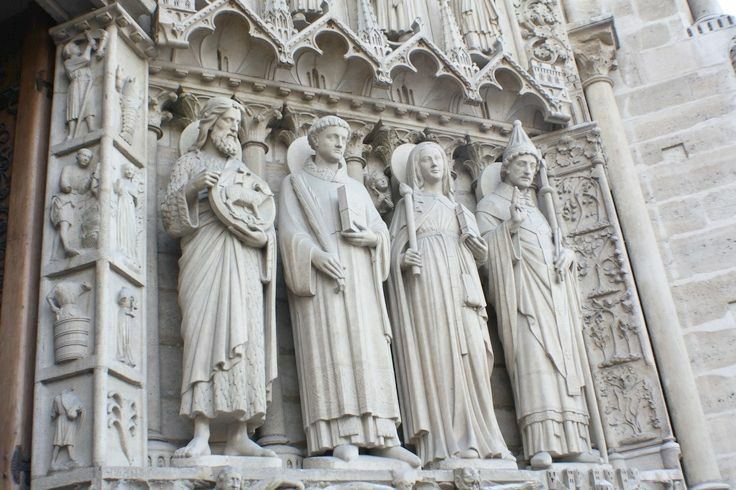 Around the portal, there are medallions sculpted in the Middle Ages, showing scenes from the lives of students and professors at the University of Paris, which was founded by the Church. 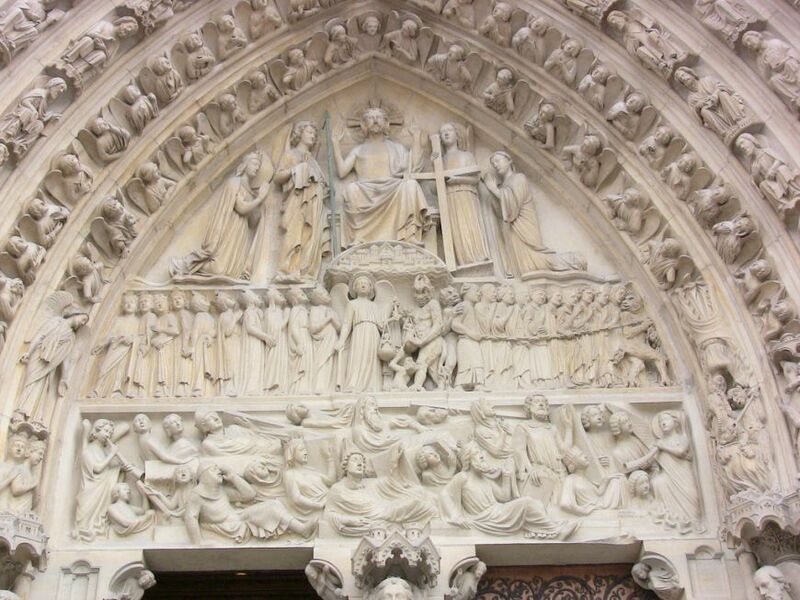 The Portal of the Last Judgment is in the centre of the façade. 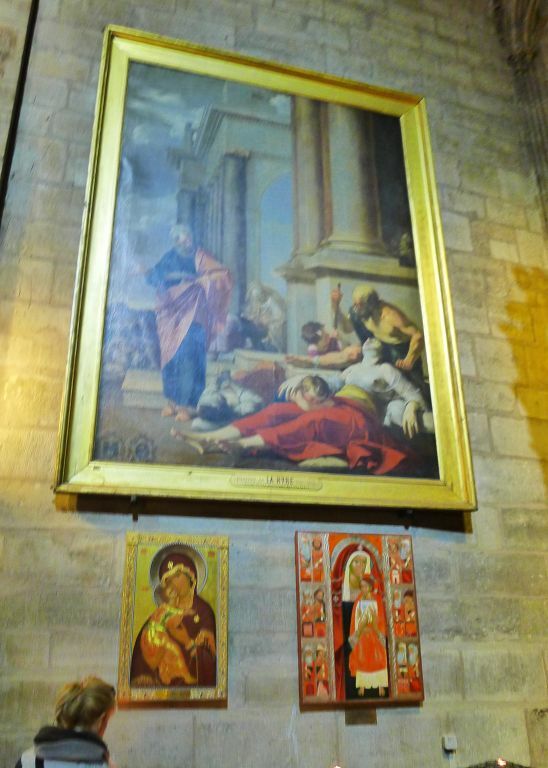 Jesus is represented welcoming us while Mary and Saint John pray for men. 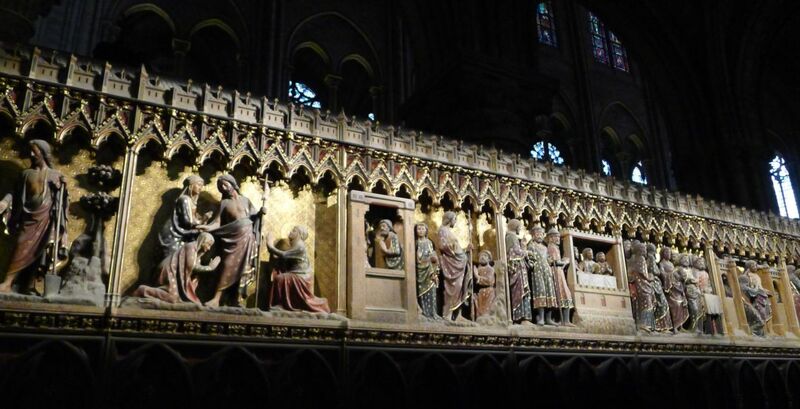 Below is a depiction of the Resurrection, and the middle portion shows the weighing of the souls, where the chosen people are taken to heaven by angels, and the others, who did not choose to love God and their fellow man, are taken to hell by demons. 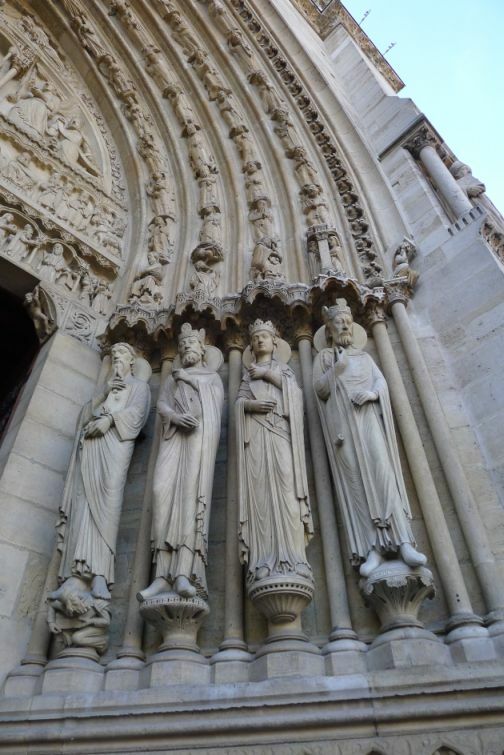 Statues underneath the portal of the last judgment portal. 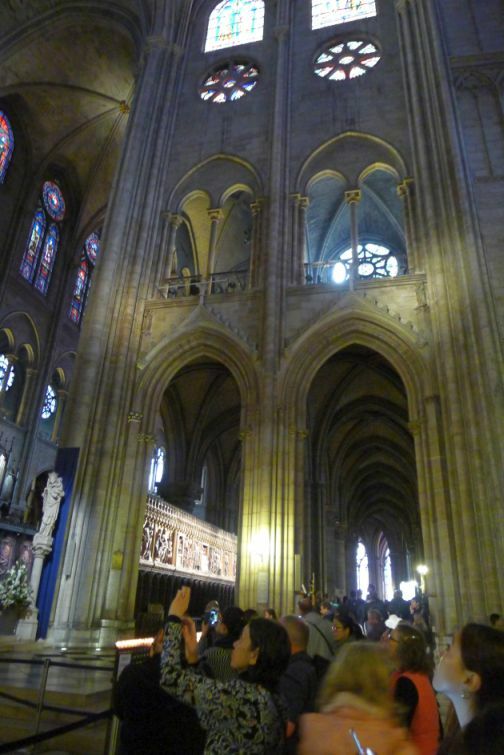 There are few things worth seeing inside the Gothic cathedral so we are getting in. 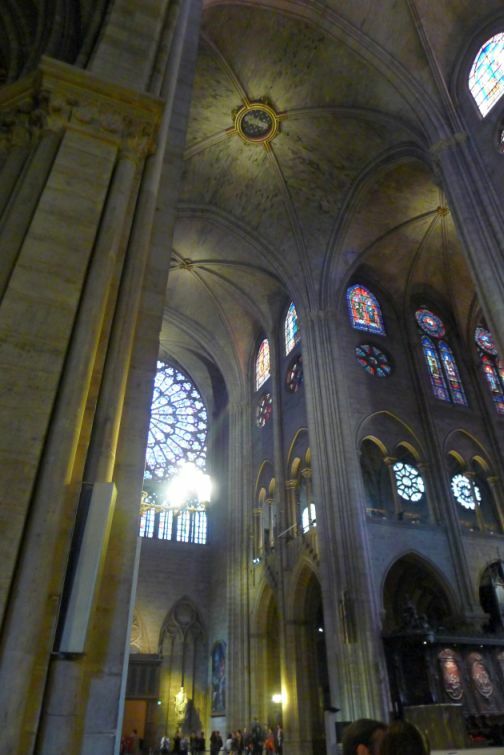 As you as you enter inside you are struck immediately by the dramatic height of the ceiling, giant columns, and the sun light illuminating all the stained-glass windows. 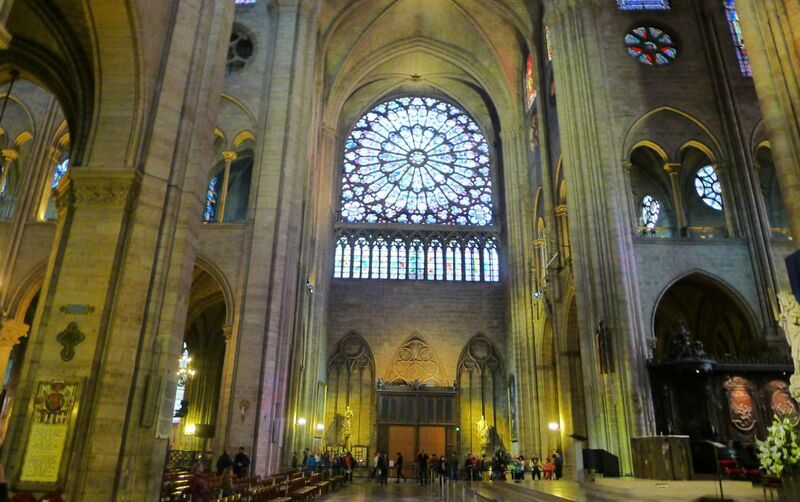 The north rose Window is on the cathedral's original stained-glass panels. 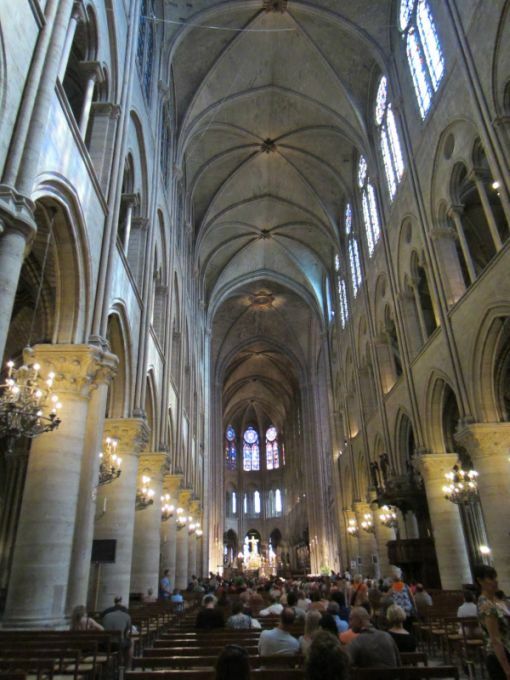 The inside of the cathedral is absolutely amazing. 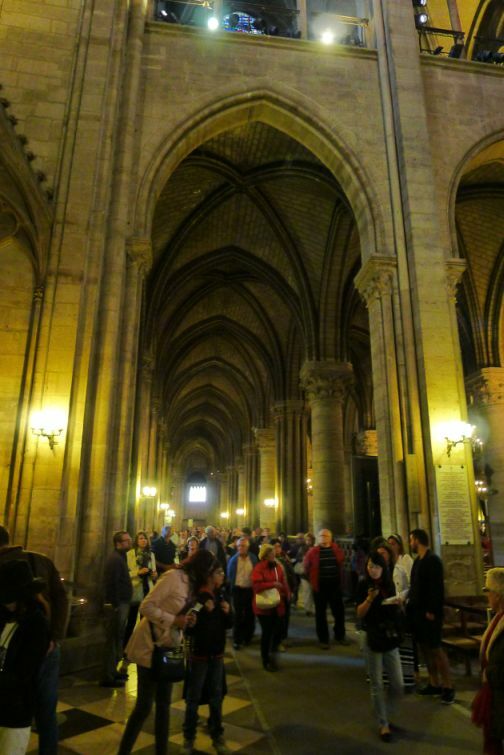 Lots of tourists and also a good amount of people attending mass. 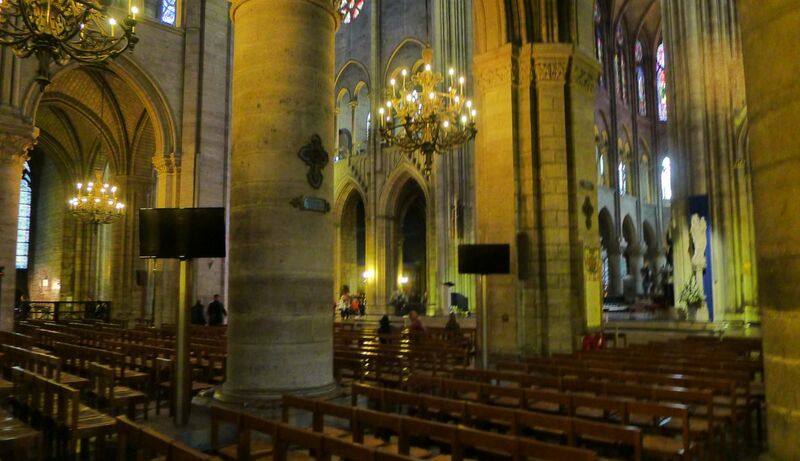 You are constantly reminded to be quiet inside the cathedral. 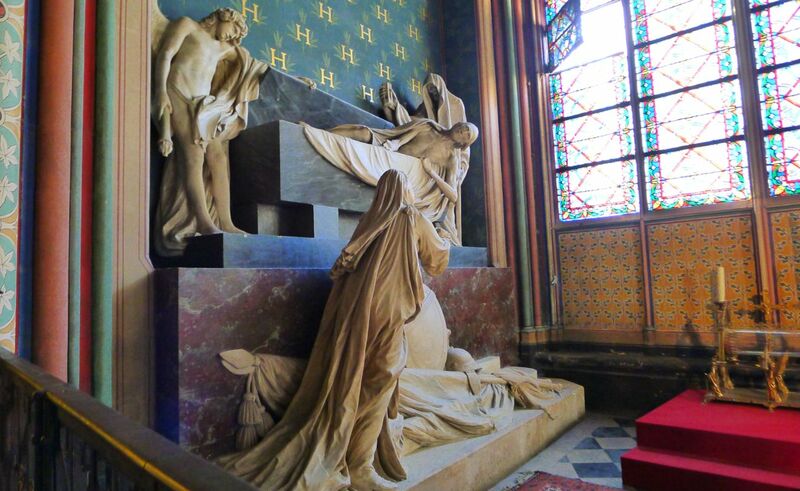 Sculptures depicting the appearances of the risen Christ. 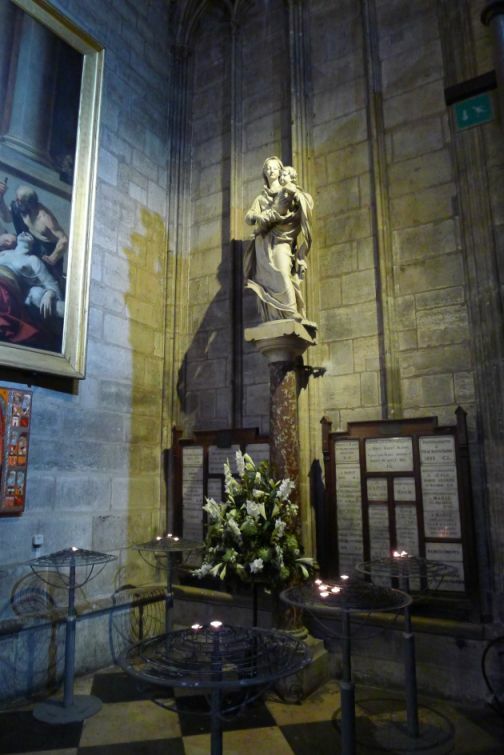 "Saint Peter curing the sick with shadow"
Ornate giant pillars with a beautiful chandelier in between each column. 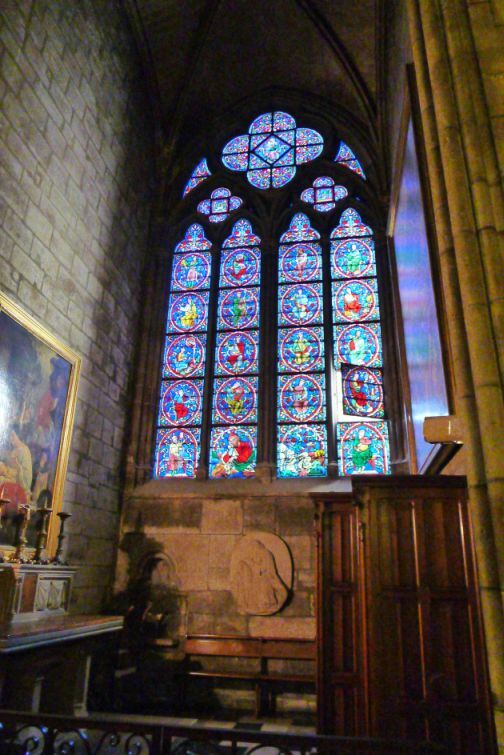 Stained-glass window view from inside and outside. 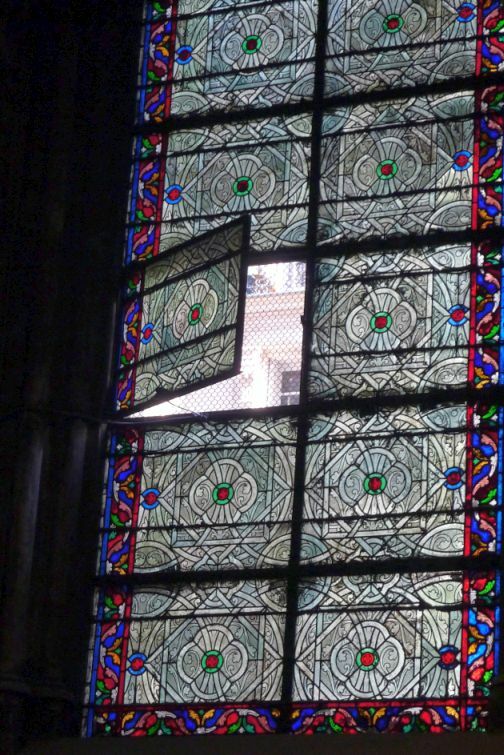 Notice that there is steel mesh from the outside to protect from vandalism. 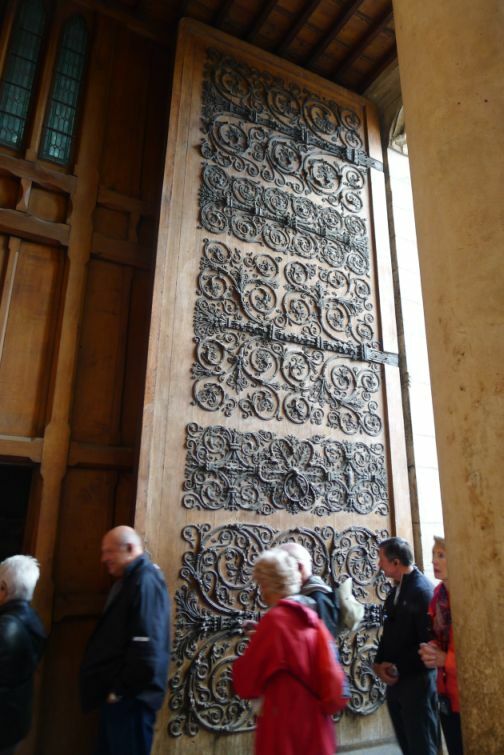 There are two heavy wooden doors given access to the inside of the cathedral. 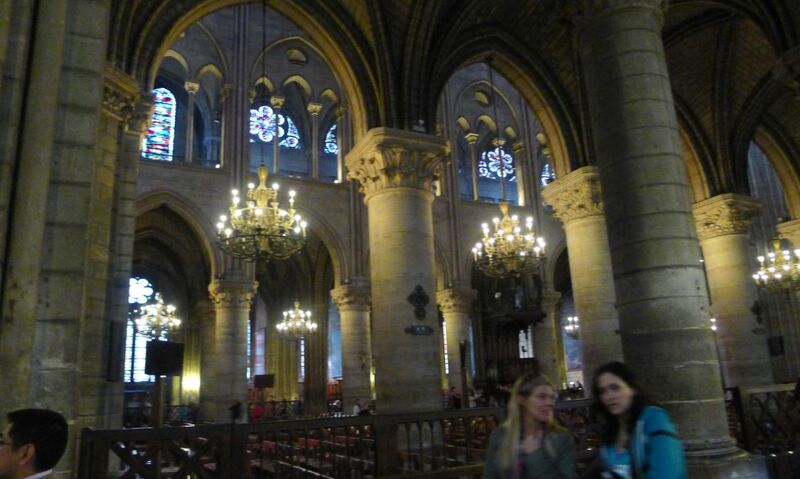 View of the cathedral as we are walking in the back. 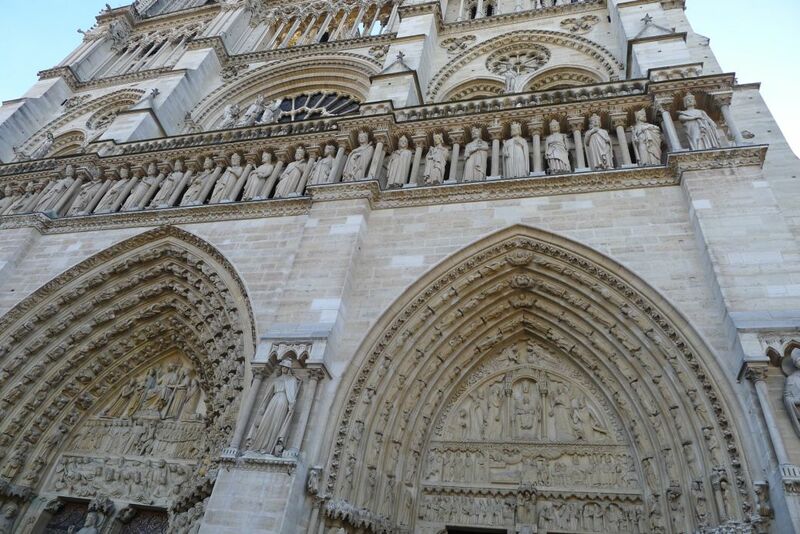 Close look at the gargoyles. 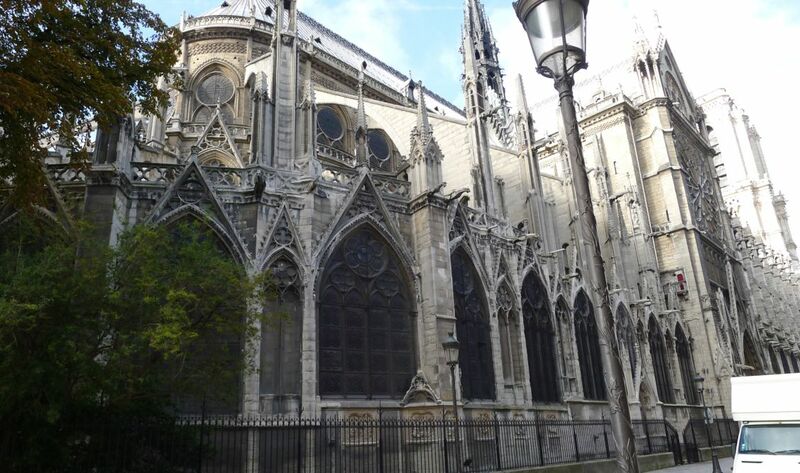 Exterior of Notre Dame from the back side.